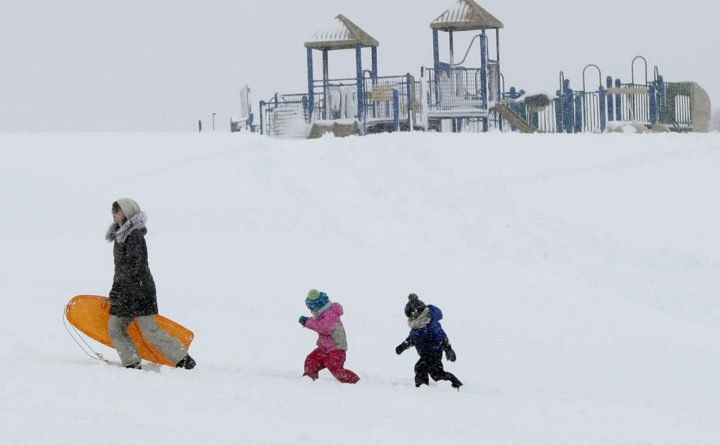 Christina Mesavage leads family friend, Una Mayer, center, and her son, Jude, up a sledding hill at the Eastern Promenade while enjoying the snow during a nor'easter Thursday, March 8, 2018, in Portland, Maine. The number of snow days means school districts have had to come up with solutions so students attend school for the mandatory number of days each year. With snow days piling up, Maine school administrators are getting creative in how to make them up without delaying graduation ceremonies or cutting too deeply into students’ summer breaks. With the start of spring Tuesday, yet another storm is bearing down on the Northeast, one that could bring a mix of snow, sleet and rain to Maine on Wednesday into Thursday, depending on its track. It’s a concerning forecast for Bethel-based SAD 44 in western Maine, which has already had 11 snow days. “Let’s hope this ends, this is getting crazy,” SAD 44 Superintendent David Murphy said Friday. Bethel, like many other rural Maine districts, got off to a rough start before the snow even had a chance to start falling this winter. In late October, Maine was rocked by a “bomb cyclone” that brought high winds and heavy rain, knocking down trees and powerlines across the state. Some school districts had to cancel multiple days of school as they waited for utility crews to restore electricity. A few communities missed five or six days by the first week of November. The state has seen a steady supply of serious windstorms, bomb cyclones and nor’easters since, on top of the more typical storms that force school districts to cancel classes. Most districts build around five snow days into their calendars, but for the past two years that hasn’t been enough and they’ve had to find other workarounds. State law requires that students have 175 days of school instruction each year, or 170 for high school seniors. When cancellations approach twice that number, districts have to start finding creative solutions. In Bethel, school officials earlier this month — after their eighth snow day — received approval from the Maine Department of Education to start adding an extra hour onto the school day. Every fifth extended school day counts as one full makeup day. In addition, the district pushed the last day of school back to June 22. “If we get hit with more snow days, that will be something we’d have to look at,” Murphy said. Other districts have also tacked on an extra hour in hopes of catching up, but worry it may not be enough if the weather doesn’t turn soon. Bangor Superintendent Betsy Webb said Friday that the school board may have to consider asking for permission to extend school by an hour after having to cancel eight days of school so far this year. Two of those days were accounted for by turning scheduled teacher in-service days that students would normally have off into regular school days — another common tactic to make up for lost days. The last day of school in Bangor is scheduled for June 20, and graduation shouldn’t be affected. The DOE sometimes considers waiving school day count requirements for seniors to avoid forcing schools to change graduation dates late in the year. Districts across the state are grappling with how to best make up for missed days, deciding locally whether it’s best to cut into vacation time, change workshop days into student days or even send kids to school on Saturday. Those are less-appealing options for some districts, where administrators worry instruction might suffer if a student is sitting in a classroom on a weekend or during a hot afternoon in late June. “None of these are good alternatives for productive learning,” Jeff Porter, superintendent of Cumberland-based SAD 51, wrote in an apologetic letter to parents explaining why he was sending kids to school on Friday, which was supposed to be an in-service day.